1 It’s been said that you can’t put a price tag on intuitiveness. 6 And this doesn’t take into consideration the need to sign digital forms and documents. It’s been said that you can’t put a price tag on intuitiveness. If a device is intuitive, if using it is as natural as opening a door, flicking a light switch on and off, pressing a button, etc., people will line up for it and buy it. That seems to be the magic that graced Steve Jobs’s career at Apple. As Apple’s former CEO, Steve Jobs left a legacy for a company that couldn’t have witnessed his rise at a better time. He was the true “Apple Genius,” and he passed away on Monday, October 5th, 2011 (four years ago). He changed the face of technology as we know it, and left the world of tech (and the world itself) a better place with his insight, knowledge, and his daring innovation. Apple had a chance to incorporate a stylus. Yet, Steve Jobs refused to take this path. His reason? No one wants a stylus because you 1) have to take it out, 2) put it back when you’re finished, and 3) you can lose it. And, above these three reasons, we can’t forget the first from the quote: the stylus 4) serves as a communicator, like the mouse does to a computer. The stylus was inadequate because he believed that its slight inconveniences made it a terrible writing instrument with a smartphone. To Steve Jobs, then, the stylus wasn’t intuitive. It wasn’t natural. It was just an inconvenience. For him, the iPhone would never have a stylus. To this day, Steve Jobs’s legacy lives on – at least in Apple’s smartphone collection, anyway. one wonders why Samsung ever announced the first Galaxy Note with its S Pen and created the Note category. Sure, companies disagree with sound reasoning all the time, but was Samsung wrong in disagreeing with Steve Jobs? Is it the case that the only intuitive action on a smartphone is to use our fingers? but Steve Jobs was not entirely wrong. Even today, with the Galaxy Note5, we don’t use the S Pen to navigate the display. We don’t use the S Pen all the time to open apps, or type an email, set the alarm for the next morning, and so on. We don’t use the S Pen to open or use the camera, and we don’t need to use it when we’re simply catching up on news for the day. At the same time, however, the S Pen does have a place, a significance, in the smartphone experience that makes using only our fingers at times incomplete. Samsung’s own Smart Select, formerly called “S Pen as Mouse” in the Galaxy Note 4, allows users to copy and paste words and images simultaneously. This is the same function that the mouse performs with a computer. And yet, the S Pen, coupled with Samsung’s own unique software, accomplishes this wonderfully. The S Pen does exactly what a mouse does for a PC: it lets you copy and paste without having to copy words with one action and images with another. Smart Select lets you do two things at once. And this doesn’t take into consideration the need to sign digital forms and documents. No one signs PDF forms with his or her fingers only; from an early age, it’s cute to paint with our fingers, but we’re taught to color in images with crayons and color pencils, to sign our names with a pencil or pen. Even in a technologically progressive age as ours, writing instruments are still useful and relevant. We still provide a physical signature to buy a home, testify to our sibling’s marriage on his or her marriage license, agree to a two-year contract with a carrier, and so on. 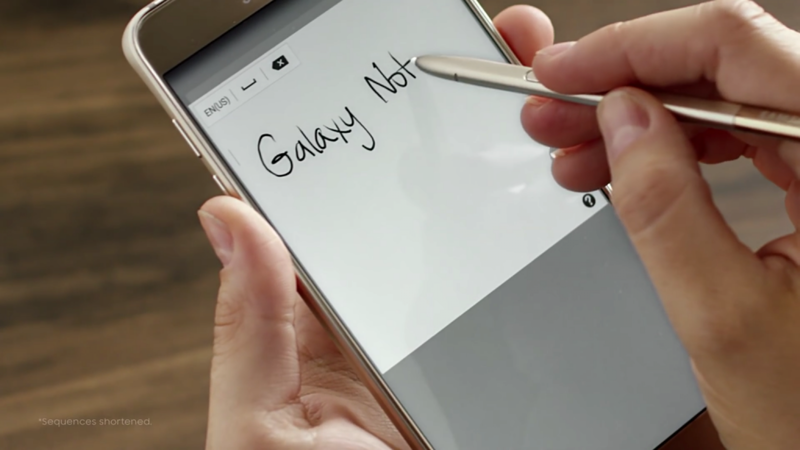 And Samsung’s Galaxy Note 5, as has been the case with the Note line prior, continues the tradition of combining multitouch (the progressive) with the reality that the “old-school” notion of handwritten signatures is still valid and thriving. Keyboard strokes will never replace handwritten signatures; like fingerprints, no two of them are alike. was Steve Jobs’s response to the stylus (and subsequently, Samsung’s S Pen) correct? Is the S Pen unintuitive and inconvenient? Not at all. The S Pen isn’t any more irrelevant than signing handwritten signatures in certain cases is irrelevant. Signing our names is an intuitive gesture that we learn from early on in life, and the Galaxy Note 5 continues Samsung’s tradition of merging the new digital age with reminiscences of the old one. Life is all about building bridges between the past and the future, and, as Apple may be learning with the Apple Pencil, new questions about intuitiveness require old answers.